This summer foliage and water image strikes my fancy now, since it looks so cool and etherial. We’ve had a run of hot and muggy weather in Vermont in recent days that has been more of a feet-of-clay feeling. Moving the mind to a cooler place is an exercise that sometimes fights the body’s pull back to the too-solid experience of heavy hot air. The exposure was so long ago that I can’t remember the specifics of that August evening. (I only know it is evening from the metadata in the file). Maybe it was hot then. And I guess in a way it is some measure of success of this image. While sometimes a photograph is successful because it is so clearly linked to a particular atmosphere and time in the so called real world, I also like it when the photo creates its own world, out of our normal experience of time. The time in the photo is not so clearly linked to any specifics except the foliage and atmosphere. That’s August, yes. August in the year forever. The photo can be viewed on the site here. This entry was posted in black and white, Infrared, New England, New Hampshire, Post Pond, summer, Water on July 21, 2015 by john lehet. As it seems to go sometimes, I was looking for another photo to post when I came across this. I don’t know why it was never posted or published before. This was in the time when I was driving a lot, and a lot of that was between Lyme NH and Canaan NH. Both had great opportunities for Hay Bale Landscapes. Later in the summer I got inspired to make hay bale landscapes as a primary subject in a trip to Iceland, but at this point it was just the way things were sometimes. Sometimes the clouds and landscape came together, and it was while there were hay bales. This uses the very subtle color shift available in an infrared image to tone the basically black and white print. 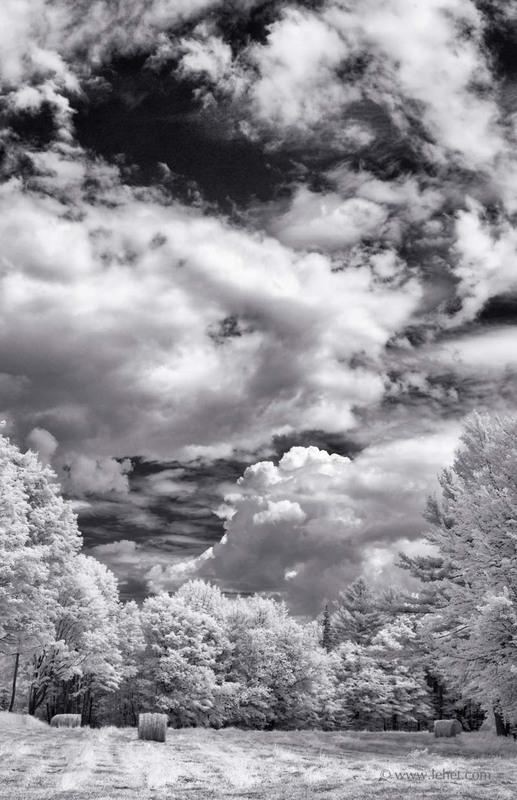 This entry was posted in black and white, Infrared, New England, New Hampshire, Panorama, summer on April 21, 2015 by john lehet. Here in deep winter, summer, sunlight, and cumulus clouds seem to hold appeal to me right now. This was from Canaan New Hampshire, where I used to drive a lot. It’s a funny town, maybe a bit ramshackle around the edges and right though the middle, but also very beautiful. My wife lived there then, and the house she rented was probably in the most beautiful spot I ever had the luck to spend a lot of time. And that’s saying something, as I’ve been very very fortunate in that regard in my adult life. In browsing through my not-yet-published collection in lightroom — photos that have made some kind of progress past raw camera data, but which nobody particularly has seen — this struck me. Why isn’t this one online? Here it is. Besides all the rest of stuff I want to work on, I have a lot of good work with hay bales that wants to see the light of day, and then some of the transition of ice-to-spring camera work from the last couple of years I think will form something of a body of work. Available for sale and to view at higher resolution here. 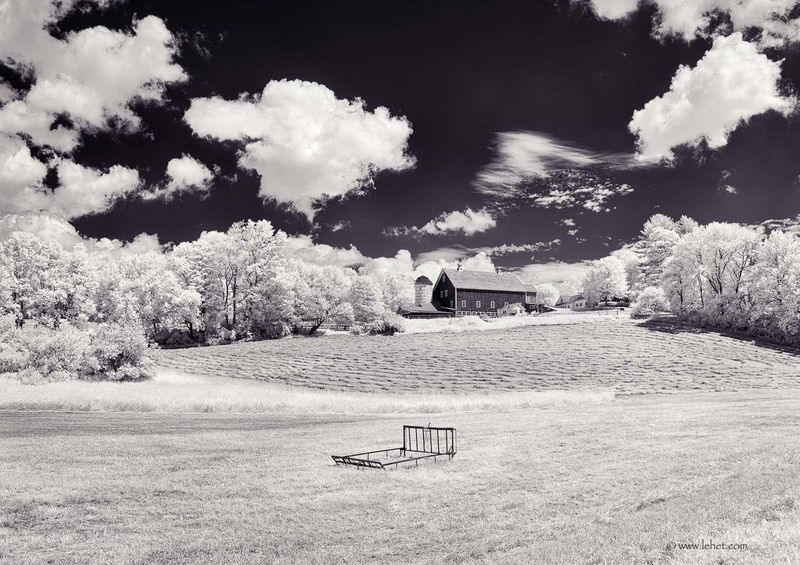 This entry was posted in hay bales, Infrared, New England, New Hampshire, summer on February 19, 2015 by john lehet. Last summer I had a bit of time on my hands while in South Woodstock Vermont, and they were haying across the road from where I was. The sky was a mix of space, summer cumulus clouds, and some cirrus — of course in rapid flux. I made a fair number of exposures, but so far this is the only one I’ve come to publish, I think because of the combination of clouds and also the object in the foreground. It’s mundane, no doubt a bit of farm flotsam, but the way it looks like a bed-frame in that space causes a bit of a nice extra jolt. Since this was put together as a panorama from vertical exposures, it has nice high resolution. I have some new winter work to publish, but oh, right now, for a sky with summer clouds and the smell of fresh cut hay. Right now we’ve got real cold and wind, like in the old days, and it’s too cold, even for me, to be out with a camera. Time in photography can be spent combing past exposures and photographing the ice on the inside of the windows in the morning. This photo is for sale and can be viewed a bit larger at this link. This entry was posted in black and white, hay bales, Infrared, New England, summer, Vermont on February 16, 2015 by john lehet. Well, it’s been a while since a new photo of the week has been published. The exhibit is down. It’s been a busy time. One thing I’m up to now is reworking a lot of my images. Hint for photographers, but not for lazy photographers: always shoot raw. As algorithms to demosaic raw sensor data evolve faster than sensors, some high end modern raw processors will do a much better job of rendering images than when they were exposed, if they’re not brand new. In that process, I’m sorting through the catalog and making piles and piles of work for myself; older images to redo, and new images to bring to light. This is one that has been on the list for a long time. It’s one example of an image that makes me want to print everything and not show on computer screens. It’s better a bit quiet, and if a screen is bright and cranked up to quite-bright, this image is a bit too hot somehow. The energy is all wrong. I almost didn’t publish it a few times, seeing it that way on the laptop, but when things are calibrated, it’s good. I’m confident it will be a good print. This image can be viewed larger here. This entry was posted in black and white, Iceland, Infrared, travels on January 8, 2015 by john lehet. Maybe the best aspect of photography is saying YES to phenomenon and experience. When I had to carry around sheet film, a limited supply of expensive stuff that then required time in the darkroom to process each sheet, it was a big commitment to say Yes to an exposure. There was pleasure, but also some torture in the decision. I figured that every hour I spent with the view camera meant several hours in the darkroom. Yes came with a high cost. A paradox of Yes is that in the physical sense, in the relative world, it is so often tied with a flip side that is a burden. Say yes to an ice cream cone, and you carry some extra fat on your waist. But then Yes on a mental level, yes to our life and experience, is liberation. Funny those two sides. Easy or hard, It’s good to say yes to experience, to phenomena, whatever side of any spectrum it falls on. The world isn’t always pretty, our experience isn’t always happy. But the funny thing is that when we look closely at it and accept it, it’s interesting. It’s amazing. That Yes helps us get close to the core of our experience, our actual life, this actual world. The opposite is rejecting our experience, our situation, our world. It is like death creeping into our life. So I think even old age (or at least middle age as I can see from here) could have the bouncing wonder of a young child if we can stop rejecting what is, and say yes to it. I don’t mean this to advocate tossing aside all discrimination. It’s part of the paradox. Connecting with the world and experiencing it profoundly requires not being aggressive toward it and rejecting it, but going hand in hand with that YES is increasing discrimination. The more deeply we go into experience the more important that discrimination is. Lugging that big box of sheet film holders was good for me as a photographer, even if there was less Yes. A very odd paradox. It’s a blessing to see whatever is, to take it in and accept it without aggression or wishing the world were otherwise. But then we don’t want to eat a scorpion or walk in front of a bus, pick a fight. Tricky business. I took some months to get to Yes with this photo to publish it, but I’m glad I’m here now. View this image larger or buy it here. 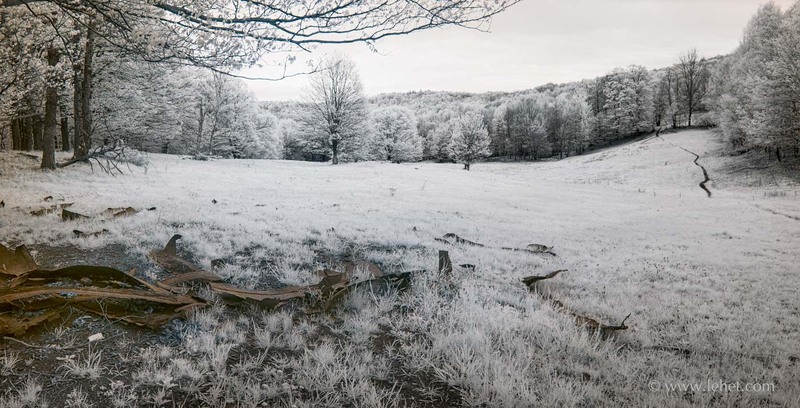 This entry was posted in Infrared, summer, Vermont on September 9, 2014 by john lehet. 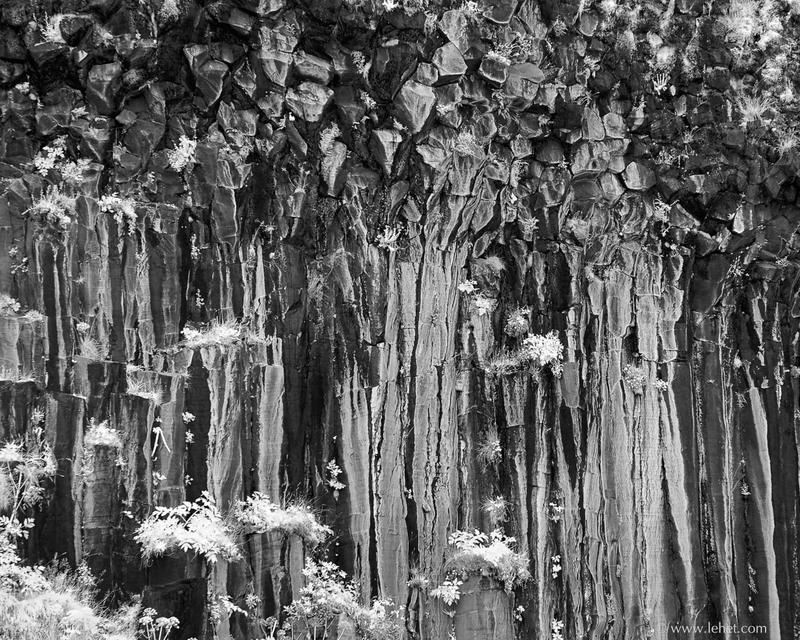 This is a spot where I’ve made a lot of exposures, in infrared as well as with visible light, especially this last spring. It’s a long walk, or a short trip on the electric bicycle. Though I’ve always been drawn to the spot, it’s hard to say what it is this spring that pulled me there so much. This is about a quarter mile and a few weeks separated from this image of Mt Ascutney. This one is looking north-ish, while the other one is across the road, a south view. It’s a good spot. There were some times when the clouds were more dramatic, some panoramas that worked out well and included those clouds. I don’t know. For now, this is the one. Something about the light and the quality of the space. Yes. This looks much better bigger on the web page. 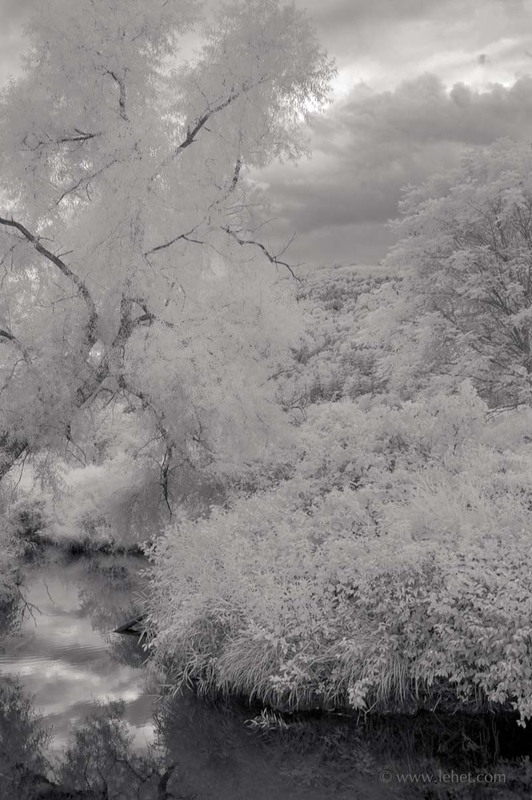 This entry was posted in Infrared, New England, Spring, Vermont on August 1, 2014 by john lehet. Sometimes these posts come because I have a photo (or several) pressing to be published, and sometimes it’s because I have something to write about. Sometimes it’s neither, and I do this out of discipline. I think it usually works out about the same. I’ve been listening to The Moth podcasts while gardening lately. These are true stories told by the people who experienced them. The one that triggered this thinking and writing was by Krista Tippett, who broadcasts interviews with a broad range of what might be called “spiritual” people. The striking thing for me in the story she told was a mention of her time in Ireland, and an ancient Celtic idea of “Thin Places.” I had never heard of this as such, by that name and tradition. As she put it, a Thin Place is “a place where the gap between the temporal and transcendent is very thin.” Well. Yes. 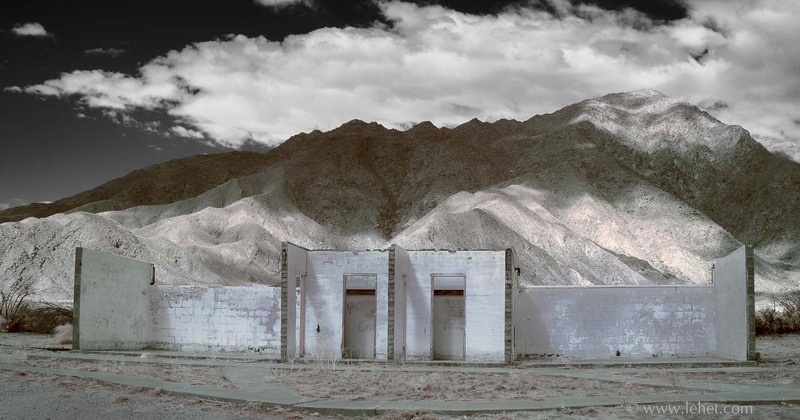 I have experienced many such places throughout my lifetime, and arguably the discovery and exploration of such places is what got me to squander so much time with a camera, and then in the darkroom and then on the computer with photos. I could elaborate endlessly, and I think I should do it in a book, and in bits over various posts. I have found as a photographer that sometimes these places are just dripping with good photographs. Other times, these places make it actually harder to photograph well. Sometimes a good photograph is made of essentially tricks — ways that compositions move the eye, textures, tones, and colors. All the normal ingredients of art applied to create a piece in the same way paint is applied to a canvas. The thing is, you still have to work as a photographer and exert the right skills, whether in a Thin Place or next to a Burger King. I have also found that the application of effort, skill, and one’s own spiritual energy to a piece of art can create a “Thin Place” right there in the art, from scratch. I realized this over 30 years ago in MOMA, Museum of Modern Art, standing in front of van Gogh’s Sunflowers. Each dab of paint radiated some energy and was a portal to Vincent’s mind — he made that happen. So in my experience, the relationship between a Thin Place and art is very tricky. 35 years of exploration have not unlocked all the secrets, or very many of them. Back to this particular spot: A few miles from my house there’s a grove of birch trees right by the road. If I’m walking or riding a bike, I stop there, almost always, and I look and feel. The other week I was stopped on my bike, when a man on a walk I had passed caught up to me and stopped: A neighbor I hadn’t met. We hit it off, had a lot in common, and chatted for probably over an hour, more time than I should have taken as I had client work promises to keep. One thing that came from that conversation was the news that the owner of the land of that birch grove allows walkers. I have been photographing a lot in recent weeks, which is another set of stories. I am in love with two new-ish cameras and some very nice lenses. I was in the emerging spring, just right in it, watching the buds swell and the leaves break out of them as if in time-lapse. I scrutinized and photographed and savored the bud-bursting leaf popping time, and I felt attached, not wanting it to pass. I wanted the leaves to stay so small and bright with light passing through them and dappling the ground and the other small bright lit-up leaves. But also enjoying the transformation, let it evolve, as everything will. So a handful of walks in this newly found trail through birch groves and pastures was part of it. It is in some ways such an old time quintessential Vermont paradise of a sort that gets harder and harder to find as there are fewer farms and less mowing, and the fields grow up to brush. But this is very unusual as such an extensive stand of beautiful birch trees. The effect of this place on me is quite profound. But I’ve found it to be very hard to photograph there; I think I go over the gap into the other side of the Thin Spot, into the transcendent. I don’t keep my wits about me as well in terms of what works, what makes a photograph, how to (as a photographer) dab the brush into the paint and onto the canvas. Somehow I want to smear the canvas right on the scene and have it transfer. But it doesn’t work that way, does it? Not in painting or always in photography — you need the intermediary of the brush and paint — or some technology — to move the energy from around you and through you and to create some kind of thing that is related to it but separate. This print is for sale and can be viewed larger here. 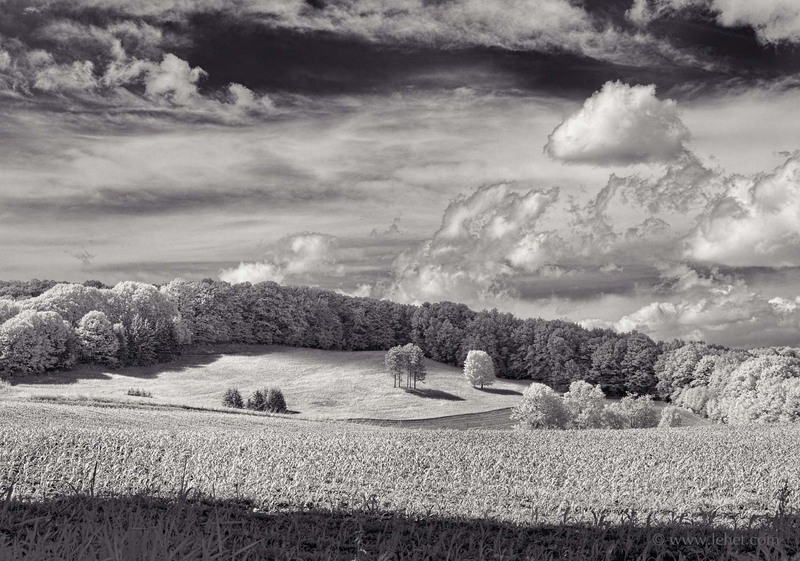 This entry was posted in black and white, Infrared, New England, Panorama, Spring, Vermont on May 23, 2014 by john lehet.